Podcast Episode 25: Vampires, Shakespeare and The Holy Grail, Oh My! What if Tom Stoppard was a horror writer? 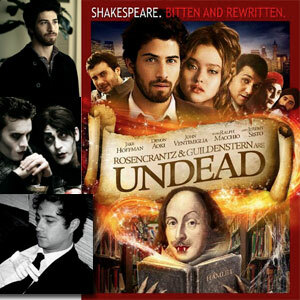 Then Rosencrantz and Guildenstern might have been undead … instead of just dead. In this week’s podcast, The Genre Traveler chats with Jordan Galland, the filmmaker behind the indie comedy horror film Rosencrantz and Guildenstern Are Undead. During the conversation, we chat about how The Holy Grail got mixed up with vampires, literary rules for vampires, dessert with Tom Stoppard and Sean Lennon, vampires becoming romantic heros rather than villains, adaptations of Bram Stoker’s original novel, Dracula, and his short film that involves a soul-capturing antique camera. NOTE: This episode is a little shorter than normal … I edited out Jordan’s cat trying to join the conversation. One of Shakespeare’s tragedies, Hamlet tells the tale of the Prince of Denmark and how he exacts revenge on his uncle for murdering his father. The play was believed to have been written sometime between 1599 and 1601. First staged in 1966, this tragic comedy is a “sequel” to Hamlet, showing how two minor characters from Shakespear’s play saw and reacted to the events therein. First appearing in Fun magazine in 1874, Rosencrantz and Guildenstern is a short comic play that is a parody of Hamlet. It was written before Gilbert became a part of the now famous duo Gibert and Sullivan. This series of novels told from the perspective of vampires started with Interview with the Vampire, in which a journalist is given an interview by a conflicted vampire, Lewis. His sire, Lestat, is the protagonist for most of the rest of the series. Two of the novels have been made into film: Interview with the Vampire starring Tom Cruise as Lestat and Brad Pitt as Lewis, and Queen of the Damned starring Stuart Townsend as Lestat and R&B singer Aaliyah in the title role. Aaliyah died in a plane crash during post-production on the film. Her brother re-dubbed some of her lines. There are plenty of others, but these have gotten the most press.